Fig. 1. The nutlets of the eight southern California species of Pectocarya, arranged in the groups given below in Figs. 4 through 7. For pictures of the flowers, see Fig. 9. 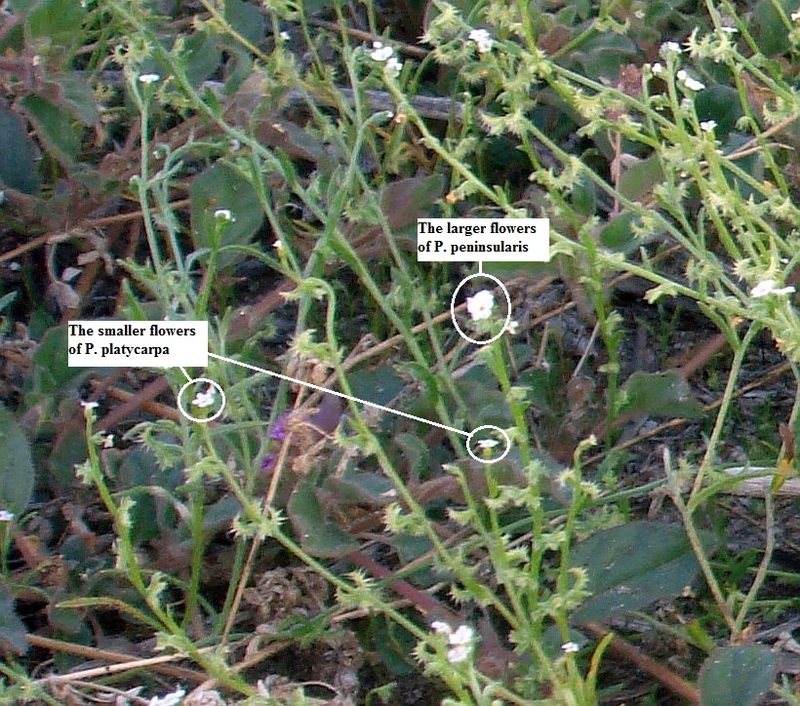 This page shows pictures of all eight of the southern California Pectocarya species, to facilitate identification by just matching pictures of the nutlets. 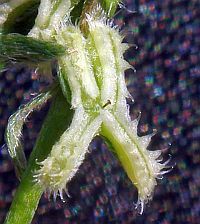 The nutlets are the seeds, usually four in number. They are called nutlets because they are "small nuts", containing a single seed in a hard shell. At maturity the nutlets are spread apart so that the hooked bristles on each nutlet can catch on passing animals to aid in seed dispersal. 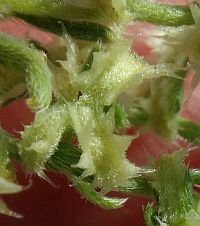 Often each nutlet is underneath a calyx lobe. Fig. 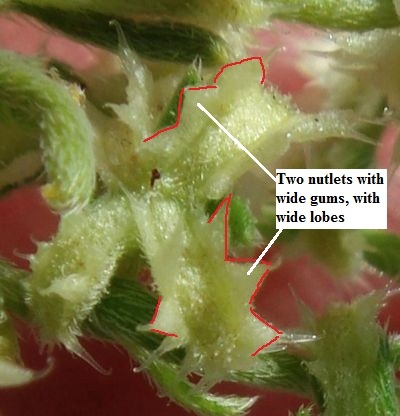 2 shows how the flowers develop into the nutlets. For identification, one needs a photograph of the underneath of the mature fully-developed nutlets. 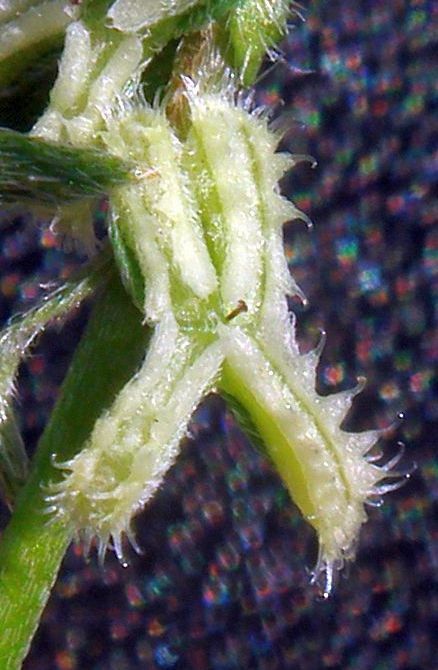 The nutlets usually have their underneath side, the side away from the calyx, pointing to the ground, so one must pick up a stem and photograph the nutlets from below. 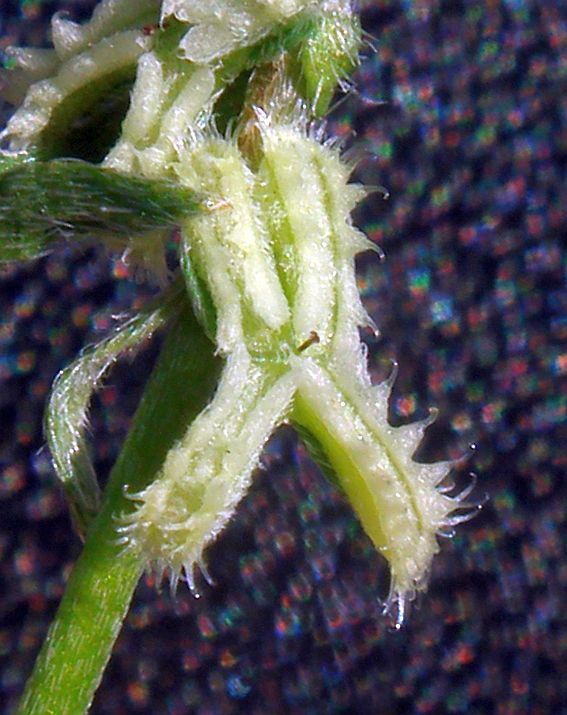 Because sometimes not all four nutlets fully develop, one should also take care to photograph a handful of nutlets, the most developed ones in the middle of the stem, with all four nutlets, from several plants. Also, for some species, the very first fruit, found at or near the base of the entire plant, are quite different from the rest of the nutlets. Observing this feature can give another characteristic to distinguish this species, but is usually not necessary. Fig. 2. 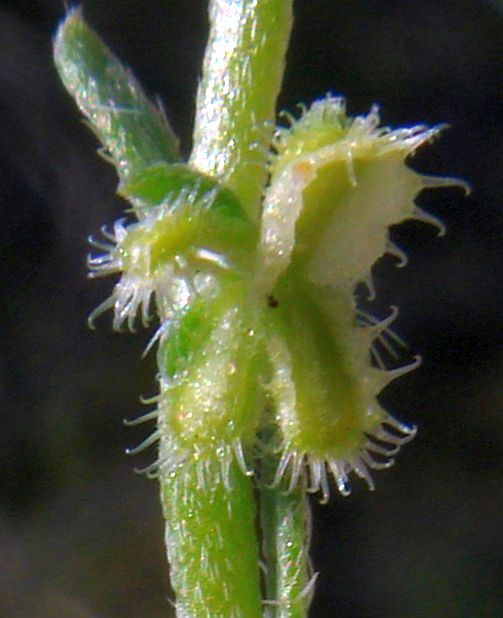 A flowering and fruiting stem of P. penicillata, showing the flowers at left at the top of the stem, developing into young fruit, and then mature fruit in the middle of the stem. On this stem, the oldest fruit is different from the mature nutlets in having one nutlets not fully formed, but this can happen to any fruit anywhere along the stem. See Fig. 8 for another example of how the nutlets can differ along the stem. Click on the picture for a larger version with the labels larger and easier to read (you might have to click on the linked picture itself to show it full-sized instead of reduced to fit your window). The nutlets of one of our species, P. setosa, are unique. 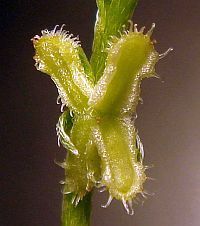 They are roundish, and presented upward at each node on an erect plant, with the calyx underneath the nutlets when viewed from above. 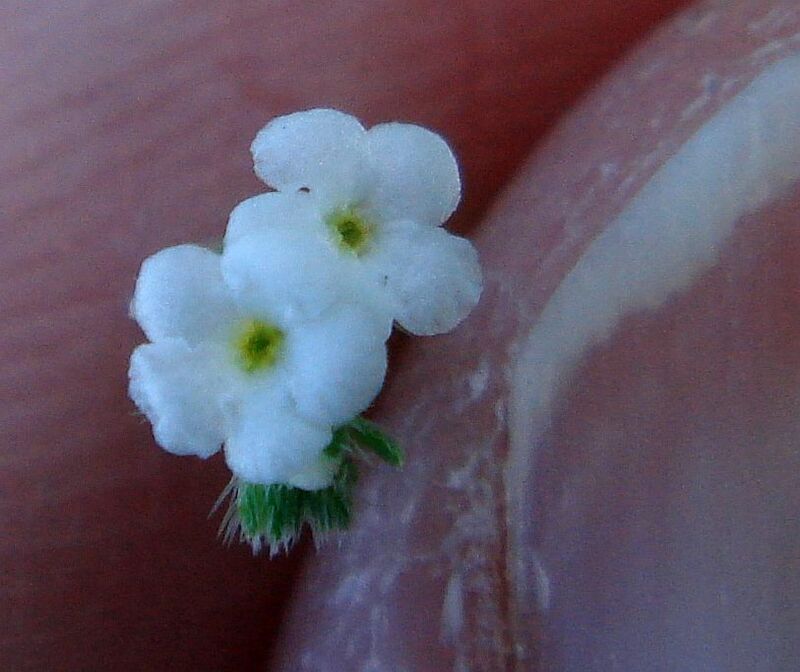 When the plant is viewed from a bit of a distance, the seeds form what looks like a tiny dinner plate at each node (up close one can see there are two to four separate even tinier dinner plates). 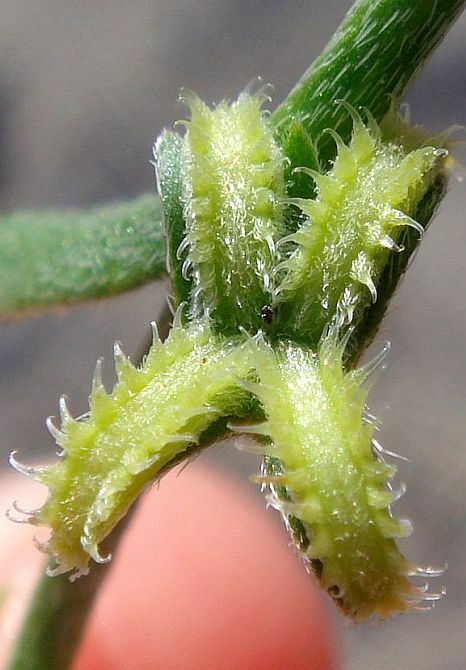 The nutlets of the other species are oblong, and presented downward at each node, with the calyx on top of the nutlets as seen from above, generally (but not always) on a prostrate or decumbent plant. The nutlets are little narrow rectangles in shape, generally with hooked transulent bristles along their edges. Each one of those nutlets looks similar to an animal jaw with teeth, usually with a "gum line" on top of the base of the nutlet, and "teeth" protruding from the "gum"; see Fig. 3. 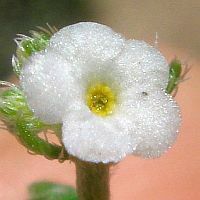 In floras, the "gum plus teeth" is often called the ornamentation of the nutlet, with the gum, or sometimes the "gum plus teeth", called a wing or nutlet margin. 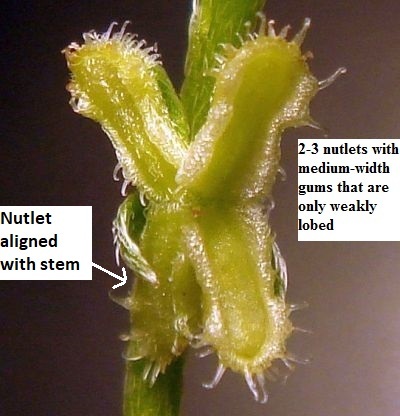 I won't use that terminology since I've found that using "gum plus teeth" is much easier for the average botanist to understand when looking at the nutlets in the field. Fig. 3. 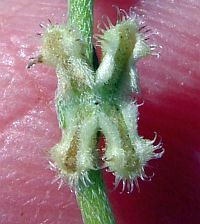 The nutlets of Pectocarya peninsularis, showing the thick gums found on two of the nutlets, and the thin gums on the other two nutlets, with very-slender translucent hooked bristles, the "teeth", emerging from the gums. The top of the gums are indicated by the red line; the bottom is shown by the yellow line. 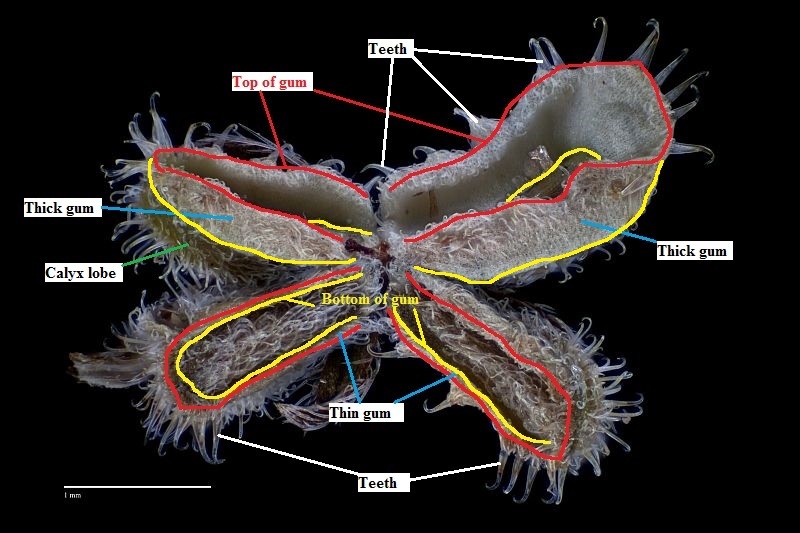 Note that the bottom of the gum is hidden for much of the inside portions of the upper two nutlets, and the yellow line there thus only traces the visible bottom of the gumline for those nutlets. 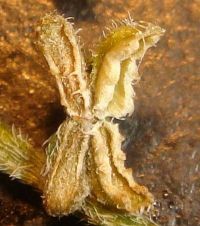 For this species, most of the teeth are at the far end of the nutlets. 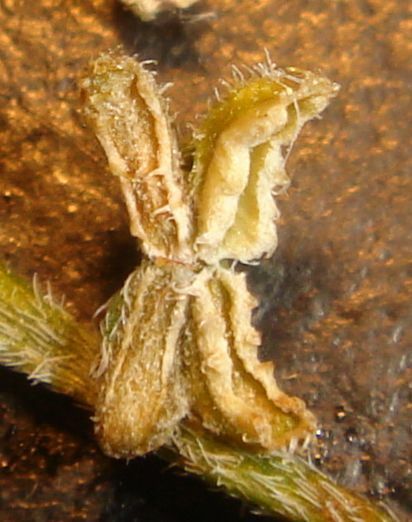 Calyx lobes are often found at the base of the nutlets, and also have teeth at their margins. Base photograph by Mike Simpson; labeling by Tom Chester. The nutlets provide the easiest way to identify the Pectocarya species. Some of the characteristics that separate them are as follows. In a single fruit, the four nutlets can all be identical in some species, or one or more of them can be dramatically different from the other nutlets. The thickness of the gum and the shape of its upper margin varies between species, as do the number and placement of the teeth. Those characteristics are used to sort the nutlets of the species in the following figures. Our single Pectocarya species forming a "dinner plate" from its roundish nutlets is P. setosa, shown in Fig. 4. 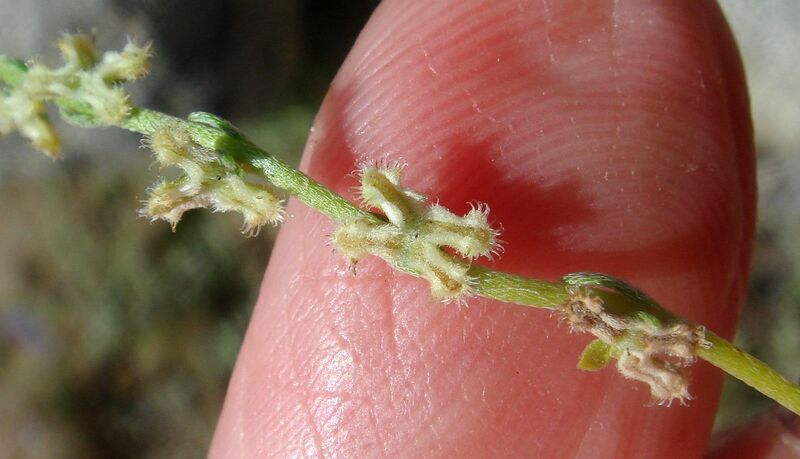 We have seven Pectocarya species in southern California that have oblong nutlets. 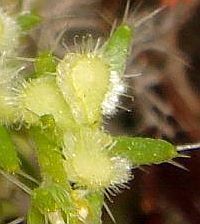 Two of those species have no or little gum on any nutlet, P. linearis ssp. ferocula and P. recurvata, and are shown in Fig. 5. They primarily differ in how curved their nutlets are. P. recurvata often has some nutlets curved 90° or more along its length, whereas P. linearis ssp. ferocula generally only is curved slightly, only at the tip of the nutlet. 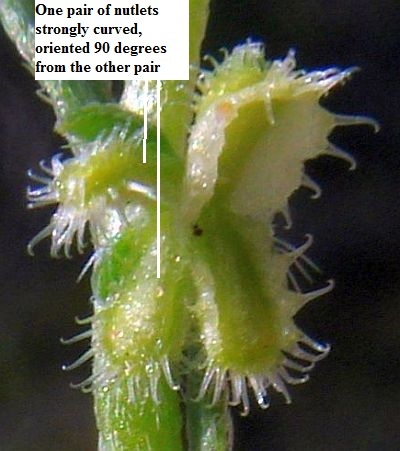 It helps to check a number of nutlets for curvature, since some nutlets of P. recurvata are not as curved as others, and the curvature is only fully developed on mature nutlets. 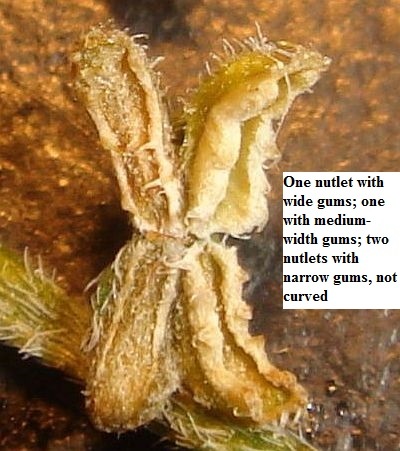 One species, P. penicillata, has all four nutlets with a prominent gum whose width varies along the length of the nutlet, making it appeared widely lobed, with teeth concentrated at the far end of the nutlet, shown in Fig. 6. Four species have nutlets which have one pair of nutlets very different in appearance from the other pair, P. anisocarpa, P. heterocarpa, P. peninsularis and P. platycarpa. They are shown in Fig. 7. 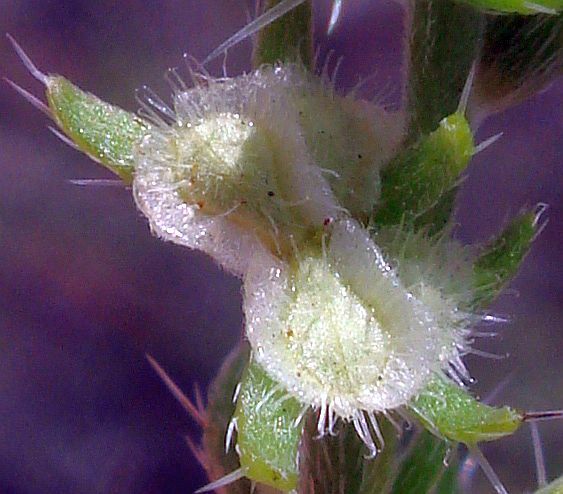 The nutlets usually easily distinguish P. platycarpa and P. heterocarpa from all other Pectocarya species. If you aren't sure about separating P. heterocarpa and P. peninsularis, see P. heterocarpa and P. peninsularis for much more on distinguishing those two species. The other two species in this group of four, P. anisocarpa and P. peninsularis, are more-subtly distinguished, especially due to the variability in their nutlets. 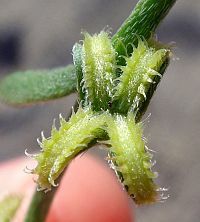 The nutlets of the plants of P. anisocarpa in the Borrego Desert all appear to have at most medium-width gums, as shown in Fig. 7 and Fig. 8, whereas the nutlets of P. peninsularis have one nutlet with wide gums. The very first fruit of P. peninsularis is markedly different from its other fruit, with much-reduced gums and teeth, whereas the very first fruit of P. anisocarpa is not substantially different from the range of variation in its other fruit. Two of these species are sometimes distinguishable at a glance in the field. 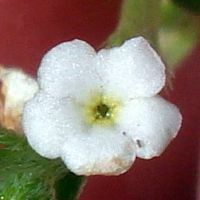 P. peninsularis has the largest corolla width of any Pectocarya species. 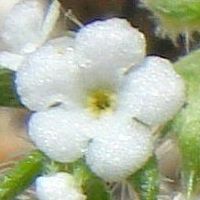 Ron Kelley says that it is "the only Pectocarya species that appears to want to be pollinated". 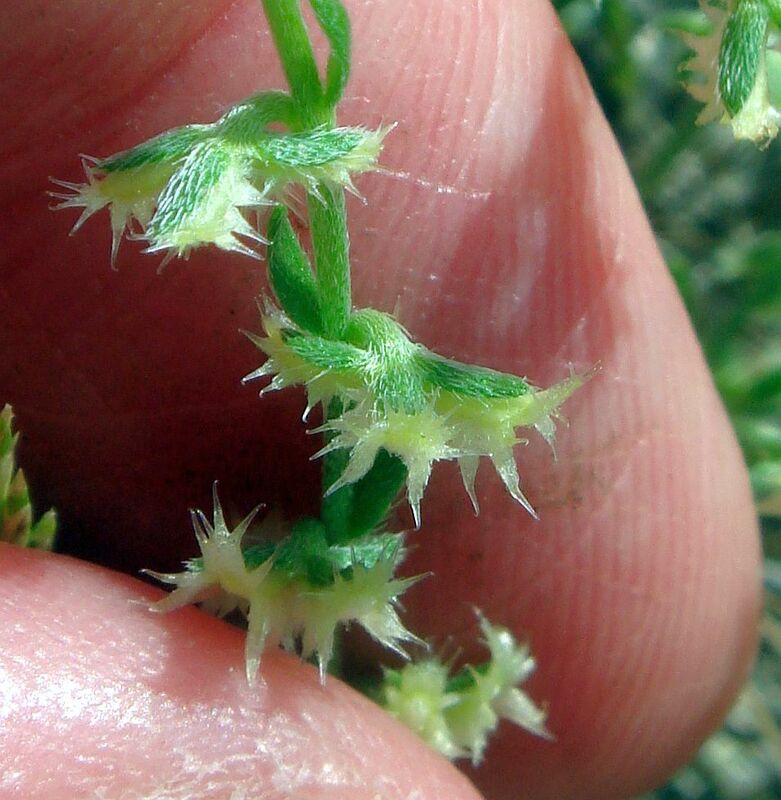 P. platycarpa has stems that are usually erect and its very gummy / toothy nutlets stand out even at a glance; see the two species together in this picture and this one. Fig. 4. The nutlets of P. setosa, the only Pectocarya species in southern California with roundish nutlets (including the gum). Click on the picture for a picture of more of the plant. See also Mike Simpson's page on this species. Fig. 5. 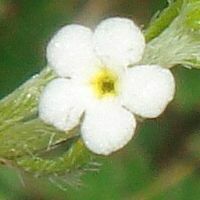 Left: P. linearis ssp. 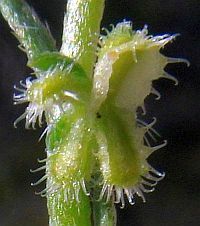 ferocula, with nutlets recurved only weakly near the tip, and with some visible gum (the amount of visible gum is variable). 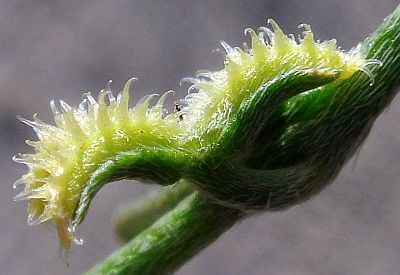 Right: P. recurvata, with nutlets recurved along their entire length, and very little visible gum if any. Click on the pictures to go to Mike Simpson's pages. Fig. 6. P. penicillata, the only Pectocarya species with all four nutlets with prominent gum that is widely lobed. The teeth are concentrated at the tip of the nutlet, with few teeth elsewhere on the nutlet. Click on the picture to go to Mike Simpson's page. Fig. 7. The four Pectocarya species with strongly-dissimilar nutlets. The picture labels show some of the distinctive features for each species. Two of these species are distinguishable at a glance in the field. 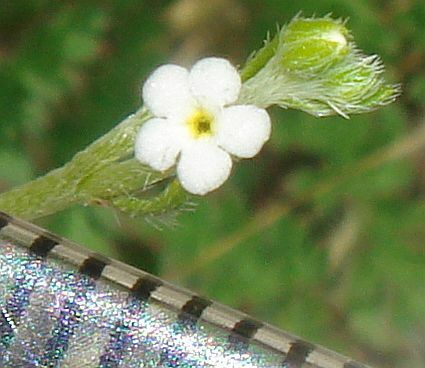 P. peninsularis appears to have the largest corolla width of any Pectocarya species, and P. platycarpa has stems that are usually erect and its very gummy / toothy nutlets stand out even at a glance; see the two species together in this picture. 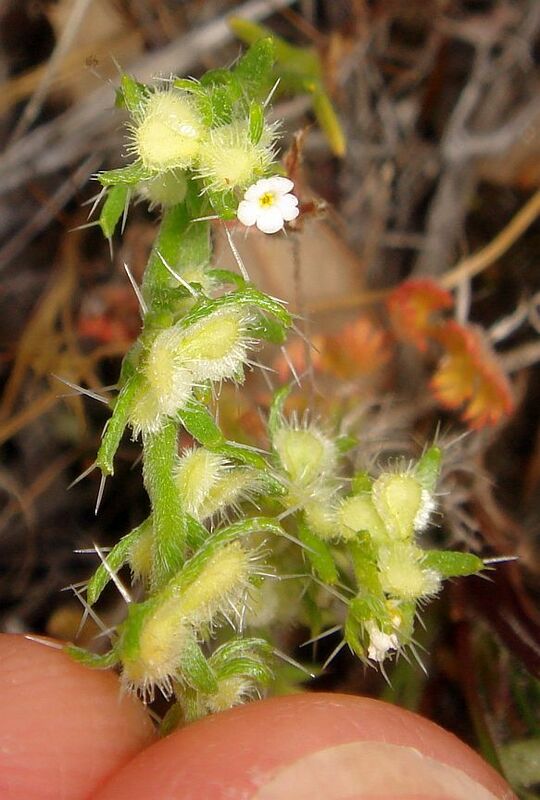 See also P. heterocarpa and P. peninsularis for more on distinguishing those two species. Click on the pictures to go to Mike Simpson's pages. Fig. 8. Six fruit of P. anisocarpa, in order along the stem, from the oldest first formed fruit, #1 at top left, to the youngest developed fruit on the stem so far, #6, at bottom right. Note that fruits #1 and #5 both have only three nutlets. 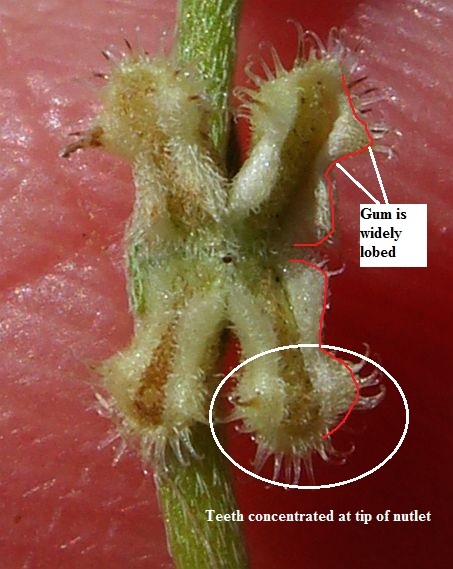 The thickness of the gum, especially for the one with the smallest thickness, varies among these fruit. 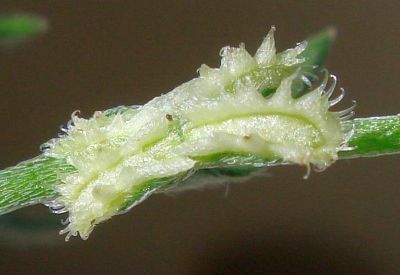 The orientation of each picture is with the youngest part of the stem upward (note that the stem hairs are appressed upward); see photograph of the entire stem. Click on the pictures for larger versions. Just for fun, and to show how similar the flowers are for all these species, Fig. 9 shows pictures of fresh flowers in the field. 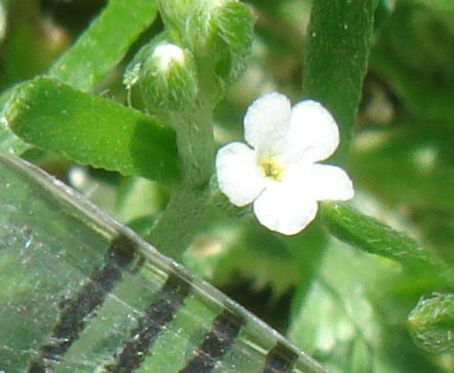 The pictures are not to the same scale, since not every photograph had a scale in the picture at the same distance from the camera as the flower. However, it seems likely from the measurements given in Table 1 that the flower width only varies by something like a factor of two (a factor of four in area) in these species..
Four of the pictures had a ruler in them at the same distance from the camera to give good measurements of the size; see the linked pictures for those species to view the ruler. 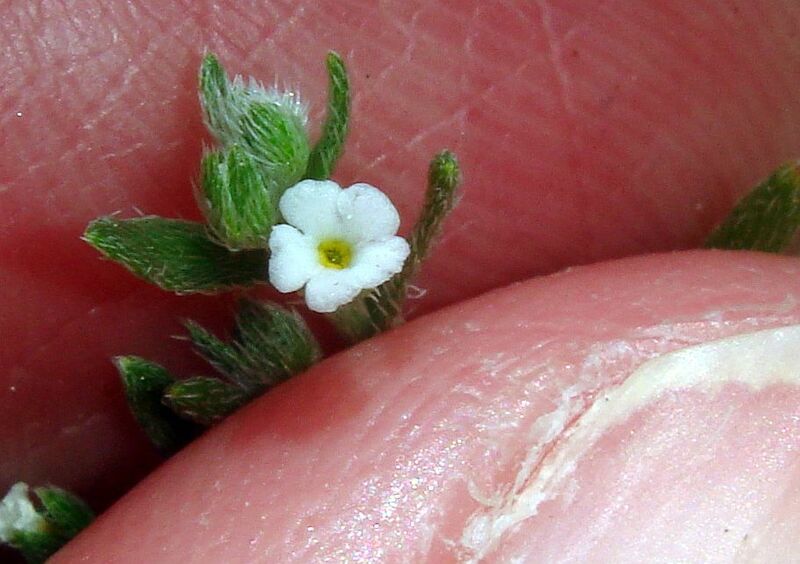 The other four pictures only give an upper limit to the size, since the flower was somewhat closer to the camera than my fingers, which I used for a reference scale. Table 1 gives the measurements made from the pictures. 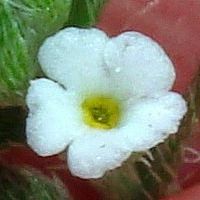 If a range of measurements is given, I measured several different flowers, either in the same photograph or in different photographs. Note that all of these measurements, except for the corolla width of P. peninsularis, are larger than those given in Guilliams et al, presumably because my measurements are of fresh flowers, and the measurements in Guilliams et al were done from dried corollas, which almost surely shrink considerably. 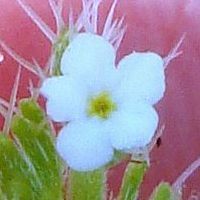 Guilliams et al also give excellent information about how much the corollas decrease in size from the first flowers to the last flowers. 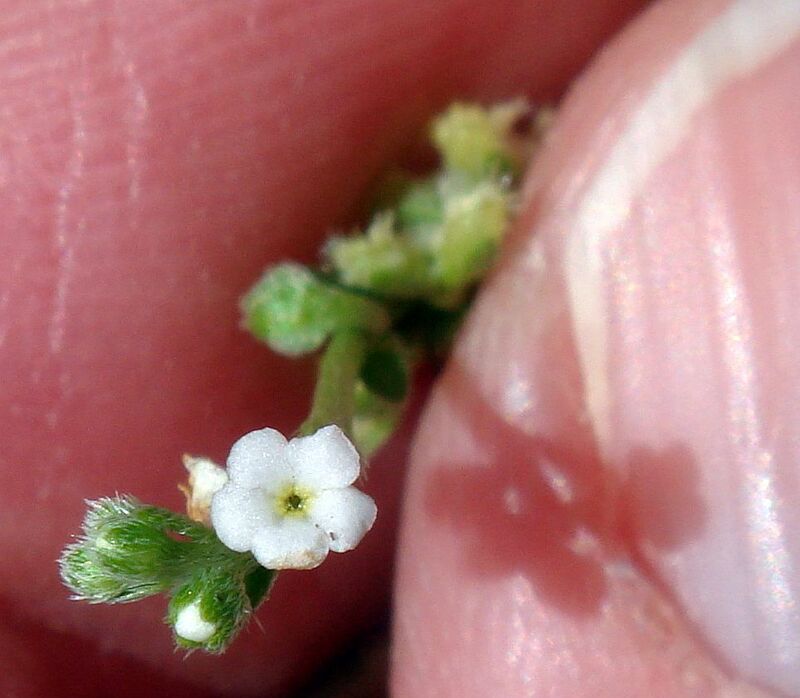 Guilliams et al state that the first flowers of P. peninsularis have corolla widths of 3.0 to 3.5 mm decreasing to 1.5 mm for the last flowers, and that all other species have corolla widths of 1.0 to 1.5 mm decreasing to 0.5 mm. Since I don't know where in that sequence the flowers I measured fall, the numbers in Table 1 should be interpreted with caution. The numbers in Table 1 appear to show that the corolla width of P. peninsularis probably is the largest of all Pectocarya species. 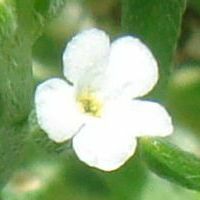 However, due to some species, including P. peninsularis, having only upper limits for the corolla width, and due to the known variation in corolla size between first and last flowers, not taken into account in Table 1, its much-larger corolla width is not easy to deduce from Table 1. 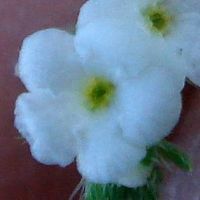 However, my experience is that it is indeed true that P. peninsularis has significantly-larger flowers than the other species. 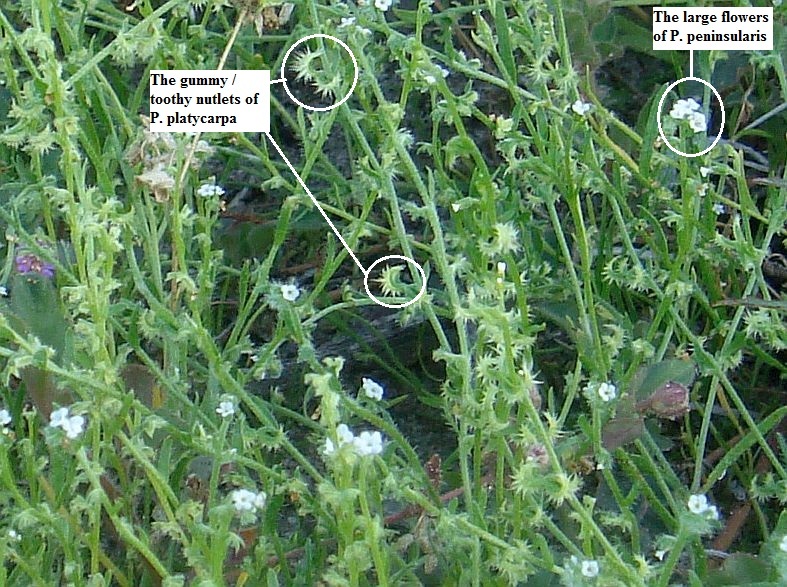 For example, in a photograph of P. peninsularis and P. platycarpa growing together, the corollas of P. peninsularis clearly stand out. 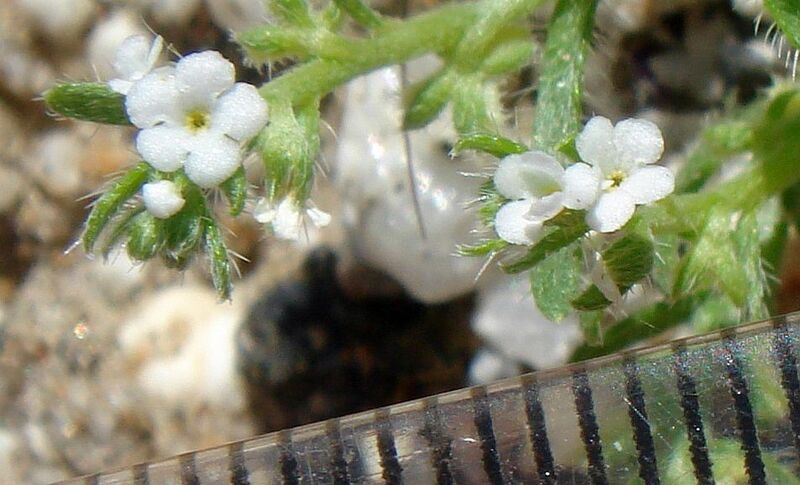 If you look closely, you can see the corollas of P. platycarpa in the linked picture as well, and they look consistent with being roughly half the corolla width, four times smaller in area. Fig. 9. The flowers of the eight southern California species of Pectocarya, arranged in the same order as in Fig. 1. The flowers are not at the same scale; see Table 1 and the discussion in the text for the difference in corolla widths. Click on the pictures for larger versions, three of which show a ruler in the picture, and one where my thumbnail is at the same distance from the camera lens. 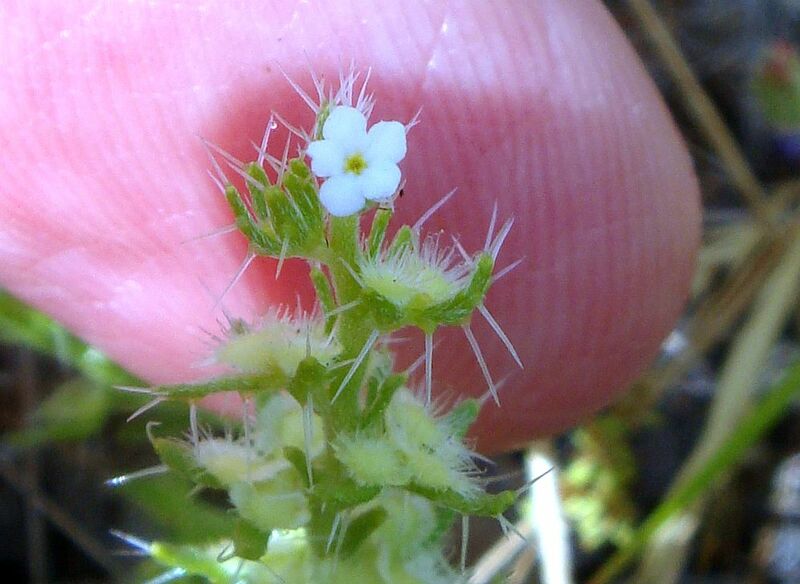 I thank Ron Kelley for pointing out to me in the field that the "weird P. heterocarpa" in Blair Valley was actually an undescribed species, P. anisocarpa, as well as sharing his insights into a few other Pectocarya species. I thank Matt Guilliams for sending me a copy of his paper on that species, which also gives photographs of all of our species. I thank Mike Simpson for his wonderful Pectocarya online pages that show such beautiful pictures of these species, which have been very helpful in my understanding of these species, and for permission to use his photograph in Fig. 3. See also Guilliams, C. M., B. A. Veno, M. G. Simpson, and R. B. Kelley. 2013. 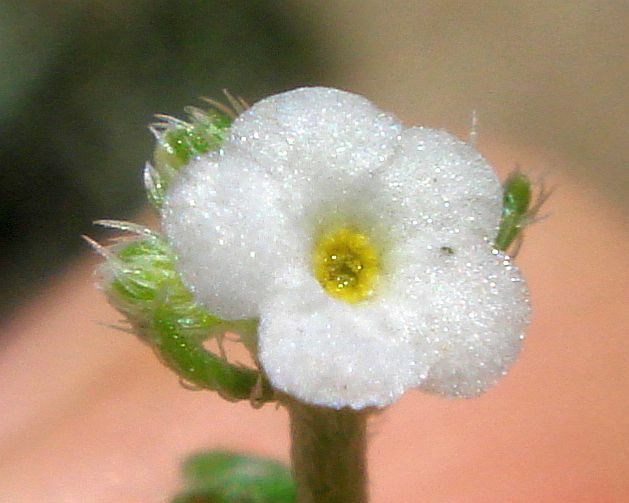 Pectocarya anisocarpa, a new species of Boraginaceae from western North America, with a revised dichotomous key and photographic atlas for the genus in the region. Aliso 31(1): 3. 2013 [15 Oct 2013] .